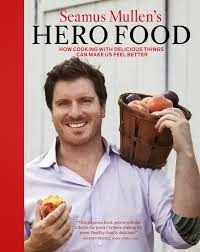 Seamus Mullen’s name would give you no clue as to this particular chef’s specialty. Chef Mullen is the chef/owner of two wildly popular and critically acclaimed restaurants specializing in modern Spanish cuisine. 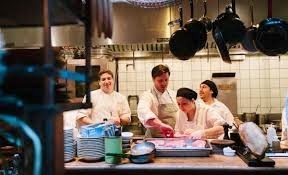 The first, Tertulia in Greenwich Village (359 6th Avenue, NYC 10012 Tel: 646-559-9909) has the stars to prove it. 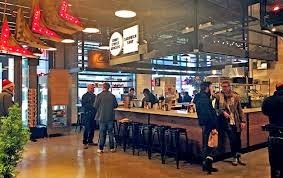 The second one, El Comado, is located in the Gotham West Market, a food court unlike any other in the city. For one thing, it’s at 600 11th Avenue, a neighborhood so far west in Hell’s Kitchen, the owners of the apartment building above it conceived the place as a way to draw tenants. Otherwise these poor souls would have to walk blocks before they found anything to eat. Instead, they can go downstairs to 8 highly original food destinations. Andrew and I were intrigued enough to head there in the dead of winter when it first opened. There’s a beer bar, a largely vegetarian place called Little Chef, which sits opposite a carnivore’s dream called Cannibal. There’s the mandatory coffee outlet, in this case one called Blue Bottle Coffee. There’s a pricy food and cookshop called the Brooklyn Kitchen. And there is a Ramen Noodle place called “Slurp Shop” which gets rave reviews and, the times we’ve been there, packed seats. 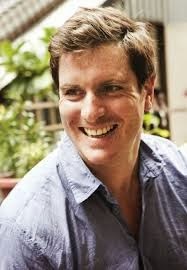 And then there is Seamus Mullen’s El Comado. The name means ‘grocery store’ in Spanish. Here it means ‘superb tapas bar’. We find El Comado so irresistible that Andrew and I have yet to even sample the Ramen Noodles or the sandwiches made at the Court Street Grocer’s Sandwich Shop or the all-day diner called Genuine Roadside. Instead, we belly up to the bar overlooking a stretch of Eleventh Avenue and eat food that might as well put us in Barcelona. That city was one stop on Chef Mullen’s path to creating great contemporary Spanish dishes. Not bad for a kid who grew up on an organic farm in Vermont. 1. In a large saucepan, heat the oil until shimmering. Add the garlic, basil, oregano, bay leaves and red pepper and cook over moderately high heat for 30 seconds. 2. Add the tomatoes and simmer over moderately low heat, stirring, until the tomatoes are saucy, 1 hour. Stir in the anchovies and season with salt and black pepper. 1. In a bowl, cover the almonds with the milk and let stand until most of the milk has been absorbed, 30 minutes. 2. Add all of the remaining ingredients except the whole basil leaves, olive oil and ricotta and mix well. Form into 1 1/2-inch meatballs and transfer to a rimmed baking sheet. 3. In a skillet, heat the oil until shimmering. Working in batches, cook the meatballs over moderately high heat, turning, until nearly cooked through, 7 minutes per batch. Add the meatballs to the sauce and simmer until cooked through, 8 minutes. 4. Spoon into bowls, top with ricotta and garnish with basil.